Set your dining room table with a fun and festive St. Patrick’s Day centerpiece. Take a couple clear bowls or vases and some assorted green, silver and gold Christmas garland and balls and mix in green micro dot battery operated LED lights to wow your guests. We’ve used a similar technique with white lights for weddings and summer parties, and it creates a great look for every holiday season! 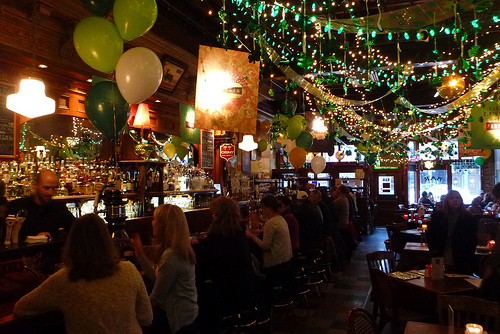 Of course, if you own a restaurant (or just really love St. Patrick’s Day), you can take your lighting up a notch! Take the decorations from the table to your costuming: add sparkle to your St. Patrick’s Day hats, ties, boas, and more… the options are endless and battery operated lights are great for this application too (both for portability and the fact that LEDs stay cool to the touch). Make a statement inside and outside with green rope light to line hallways, decks, and stairs or shape shamrocks on the walls. But don’t stop with just green, which everyone thinks of first when planning St. Patrick’s Day celebrations. Take a cue from the Irish “tricolour” flag! 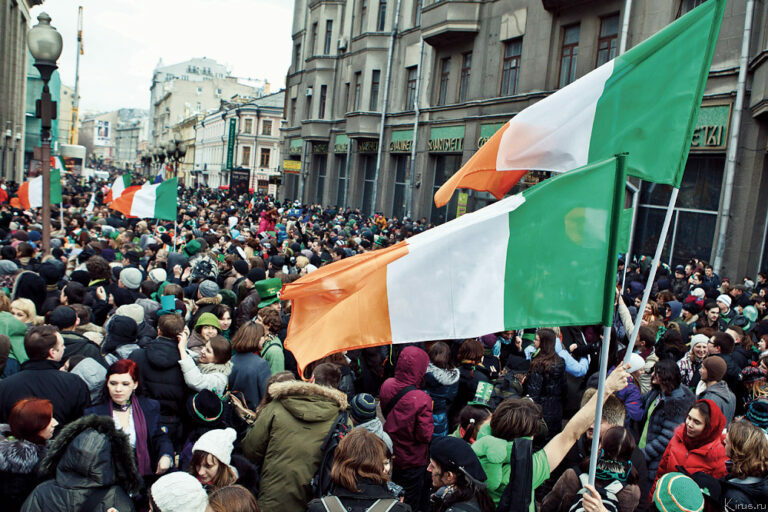 “St Patrick’s Day 2012 in Moscow” by Кирилл Сергеев (Kirus.ru) – http://kirus.ru/blog/st-patrick-day. The license is indicated above photo #33 on the blog page. Licensed under CC BY-SA 3.0 via Wikimedia Commons. The Irish flag is comprised of three equal bars of color. Green represents Irish Catholics, orange represents Irish Protestants, and the two colors meet in the middle with a band of white, representing hope for peace between the two (which have struggled to maintain peace throughout their history). So this year, expand your St. Patrick’s Day color palette for an “ecumenical” celebration: honoring all of Irish heritage and the hope of peace for all of us! 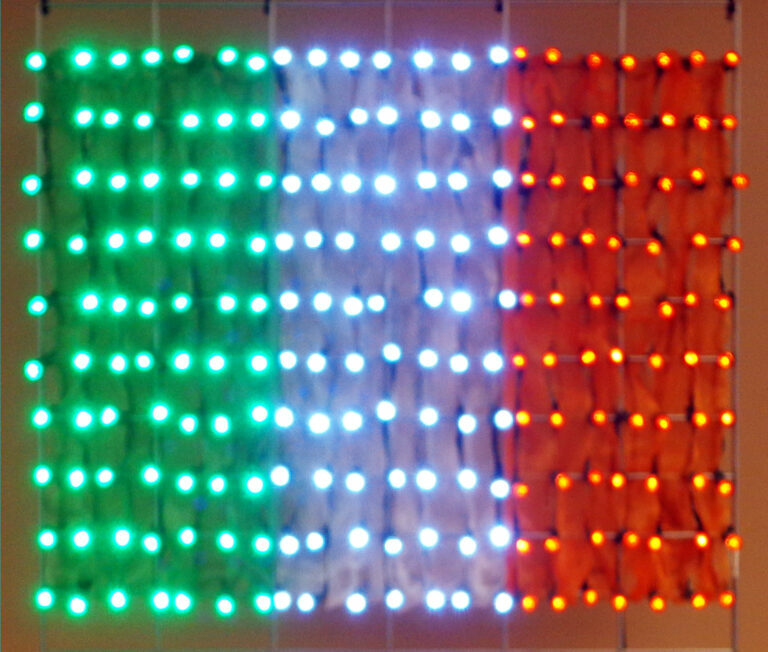 You can even create your own LED Irish flag with our tutorial, or design your own lighting display with green, orange, and white LEDs. There are so many ways to bring a little “light” into your St. Patrick’s Day festivities. With a little imagination and the luck o’ the Irish, can make this St. Patty’s day a memorable one!